and wanted to show that through the birds. I have a background that is inked in blues and picket fence and smooshed on a craft sheet. Then overstamped with maple leaves. then wondered what will I do with them. Finally I came up with the idea of stamping them onto a feather. So I asked at the school where I work for everyone to look out for feathers for me. lol…really! And the next day our illustrious Tim had assembled a small pile of duck feathers on my desk! Using Colorbox Queue dye inks I very carefully stamped some feathers. TIP: forget stamping on the fluffy bits…it just doesn’t work! But on the flat areas it stamps beautifully…so aim the main part of the stamp for that area. and finally decided on another bird. ~ and I think it kind of looks like a nest? The stamps used are from Darkroom Door, Kaisercraft, Kaszazz and Crafty Individual. NextDiamonds are a Girl’s Best Friend! Absolutely gorgeous. Love the birds and inks used. Thank You for joining us here at Loves Rubber Stamps this week. Very pretty! love the blue! Thanks for sharing with us at Loves Rubberstamps this week hope to see you again soon! Oh my Dot this is a wonderful dreamy feathery piece of art. I love the stamped feathers and well done Tim for finding the perfect ones. The blue hues are gorgeous and the bird and nest are the perfect finishing touch. This is beautifully creative, I love it. What to say my friend except that I have seen the original and it looks way better than displayed on your blog. Who would have thought to stamp onto a duck feather … well Dot of course lol. 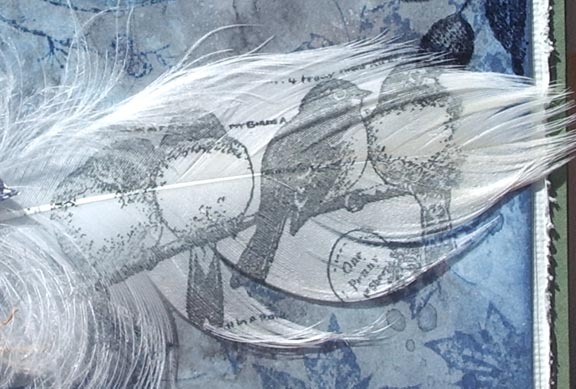 Wow, love this card, the stamping on the feather looks amazing. This looks amazing! Love the colours and of course the clever idea, stamping on feathers. Thanks for joining us at Anything Goes Challenge! Great card Doth with great stamping and beautiful colors. wow, your card is specially. It gives so many details! This is totally amazing Dot. When I first saw it, I thought surely she hasn't stamped on a feather! It looks incredible and is such an inspired idea which I would never have thought possible! Dot that's such an amazing card, love how you've stamped directly onto the feather – just fantastic. Great use of the hessian threads. Love how you've thought outside the box here and stamped on the feather! It has worked brilliantly! Gorgeous card with beautiful colours. Thanks for sharing it with us for our Fur and Feather theme at Stamping Sensations, and good luck. Dot, this is so welcoming of Spring! 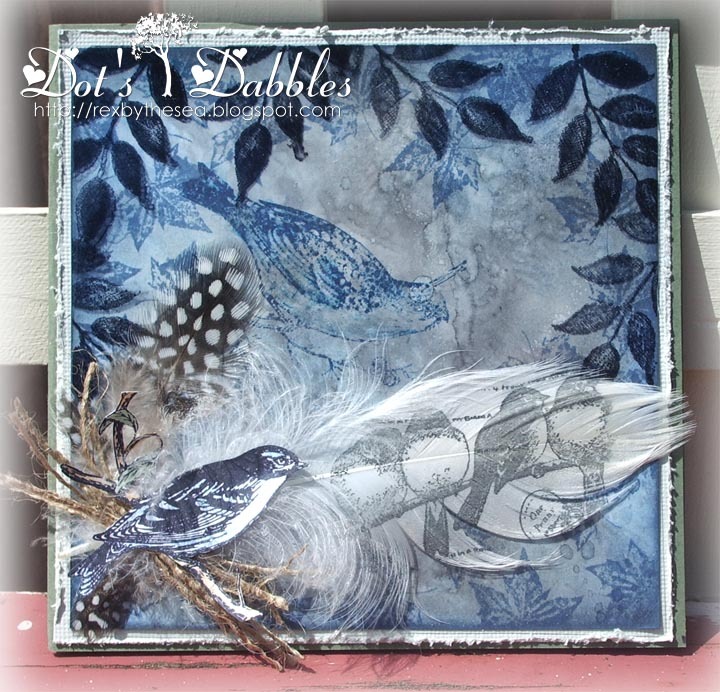 Love the soft blues and stamping on the feather is brilliant! Gorgeous! Hugs! Stunning card, love the feathers too. Thanks for joining us at Stamping Sensations this mohth. Beautiful card! Thanks for playing along with us at Brown Sugar Challenge. WOW! How unique! So different from the rest! Thanks for stopping by and joining in the Diva's challenge this week…. best of luck and hope to see you again soon! This is absolutely stunning, Dot! The stamping on the feather is exquisite… I even love where that bird on the left's tail drifts off into the fluffier bit of feather. And your afterthought of hessian threads really makes the piece for me… Altogether gorgeous! Hi Dot, my goodness that is just amazing! Wonderful idea to stamp on the feather and love your colour scheme. Oh Dot I could look at this for ages. 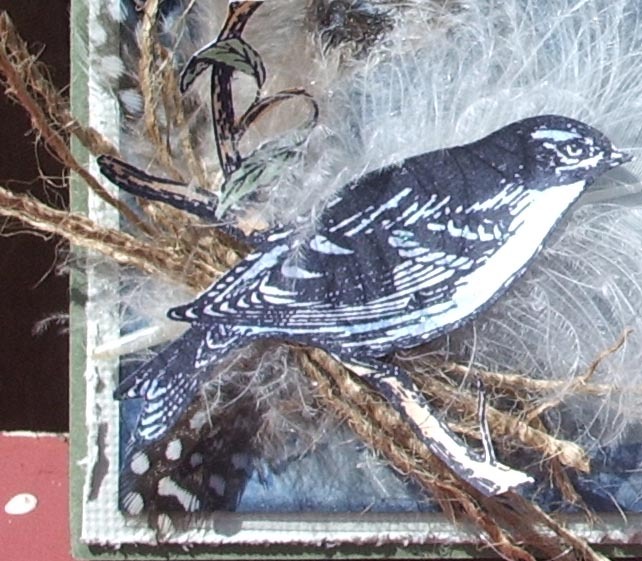 Its a beautiful card, so much depth to the background – and the stamping on the feather – just amazing. LOVE IT. Better late than never Dot as they say, I'm really running on late. An absolutely stunning piece of artwork, the tone on tone colours work perfectly and I love how the bird in the foreground is echoed in the background. Thanks so much the sharing your inspirational work with us at Stamping Sensations challenge. It took a few moments for my eyes to process that you really did stamp on the feathers…. how incredibly gorgeous this piece is! Absolutely beautiful, Dot. Seriously??? This is amazing! I love your method of layer, on all your projects. It just draws you in and is never too busy.